I have just sourced these blue Labradorite cabochons from India and I am a convert! If you have seen it you will know! 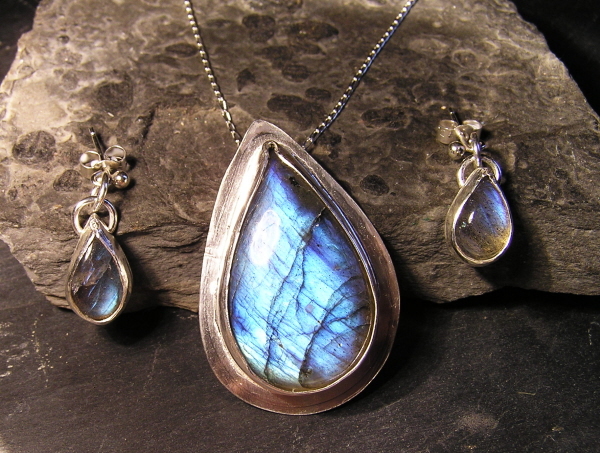 This is a matched set of Solid silver earrings and necklace. The earrings measure 1.8cm top to bottom and have individually handmade sterling silver cabochon settings and drop post settings. The necklace measures 3.8cm top to bottom with a sterling silver bezel setting and I have left a small border around the bezel for an extra shimmery silver border. It is strung from an 18 inch sterling silver curb chain. The set will be sent in two lovely velvet lined jewellery boxes and nicely labelled and would make a fantastic gift!